A new law on air pollution recently adopted by the Mongolian government is in part the result of massive demonstrations against air pollution in the capital. The new policy, however, involves even more reliance on coal. 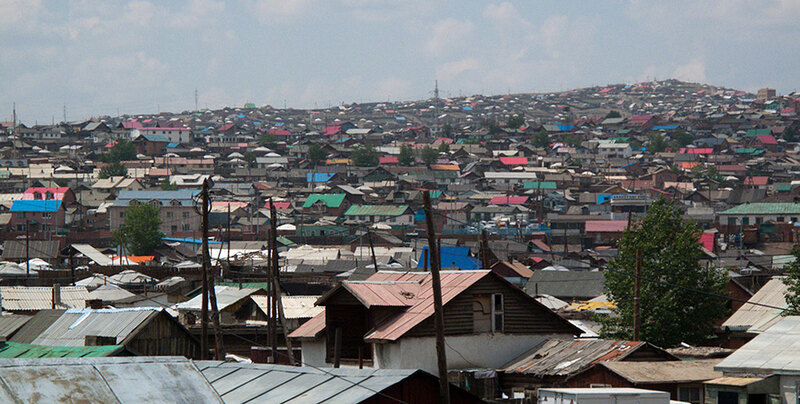 Ger district on the edge of Ulaanbaatar. A new law on air pollution recently adopted by the Mongolian government is in part the result of massive demonstrations that swept the streets of Ulaanbaatar during the winter months, when pollution in the capital is at its worst. Mobilised under the umbrella movement ‘Moms and dads against smog’, the protestors signed petitions calling on the government to come with an urgent plan for tacking the overwhelming situation in the city, where emissions from the coal burned in the surrounding ger districts and three combined heat and power plants reached some of the highest levels in the world this past winter. The new policy will soon be followed by a yearly action plan for reducing emissions, but the protestors and civil society groups working for cleaner air in the country should remain cautious. That’s because the government’s plan involves even more reliance on coal – hauled in from the massive Tavan Tolgoi mine in the south and then cleaned in as yet constructed processing plants before being burned in the ger districts that are now responsible for 60 per cent of total emissions in the capital. So the plan does not appear to tackle the underlining problem in Mongolia, which is its dependency on coal. A new Bankwatch report presented this week in Ulaanbaatar argues that the energy plans of the Mongolian government – which have the backing of international financial institutions – are disconnected from the urgent need to improve the efficiency of an ageing energy system and at the same time address the massive potential of solar and wind energy in the country. The report shows how the 12 gigawatts of planned installed capacity by 2030 would exceed even the governments’ own projections for electricity demand. This is in part because it represents an unrealistic twelvefold increase in the current installed capacity of coal. The report surveys a number of Mongolia’s coal power projects in the pipeline, including the 600 MW Tavan Tolgoi power plant in the South Gobi region, which would benefit mostly just three mines close to the Tavan Tolgoi deposit, including the EBRD and IFC-financed Oyu Tolgoi mine. In the capital, plans for a new combined heat and power plant supported by the Asian Development Bank and with potential involvement by the EBRD, would only add to emissions while not tackling the problem of burning coal in the ger districts, as these are not connected to the public utilities. To better understand what is at stake with the governments’ plans for the continued use of coal, more than 40 members of civil society groups from the country gathered on 1 May at the Water Conservation Centre in Ulaanbaatar to discuss the risks of coal-based energy and the involvement of financial institutions in pushing for coal-based energy projects in the country. Mongolia is at a crossroad, and the movement started by civil society this past winter is a sign for international financiers like the EBRD and the ADB to rethink their energy strategies for Mongolia and prioritise energy efficiency and renewable energy solutions for the the ger districts, rural areas and the people of Mongolia.